Highlighted articles. Text courtesy of Sargolini et al., 2006. I was working on my masters thesis today, and I started to think fundamentally about what my brain is doing as I work on an academic project like this. Like many other students undertaking academic writing for the first time, I have found it quite hard at various points. Sitting with a journal article in front of me, or having a blank document on the computer screen can be daunting. I have found the best solution to be to break everything down in to small pieces. 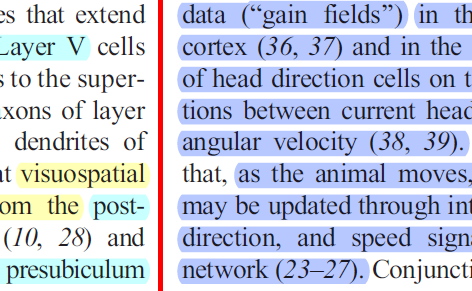 If I don’t know what I’m looking for in a journal article, I begin by just highlighting different bits of key information, such as areas of the brain, or the rationale for the study. Instead of viewing the project as a linear entity that I just need to get on and do, I look only as far as the first step that will open more doors for me. When I view it this way, I begin to realize that academic work is really just making lots of small decisions. Each decision requires me to take what I know, and decide how it relates to something else. This process is a microcosm of thousands of such decisions that will be made between the start and end of a project. For me, thinking about it this way builds my confidence and makes my work more achievable. When I tell people I’m doing a masters degree in cognitive neuroscience, I often get replies such as ‘I’d rather you than me…’ or ‘I’m too stupid to do anything like that…’ My message here is that this need not be the case. Achieving in university need not be something just for the ‘smart’. All that I do at university is practice decision making in such a way that I produce scientific research. I suppose somewhere along the way I also memorize some stuff, but that is really just a natural bi-product as I learn this new way of thinking. The point I want to make about this is that anybody can do it! I’m not saying it will happen at the click of a finger, but I am saying almost anyone can do this with the right mentoring and practice. This, however, is what separates higher education from regular learning and work. There’s lots of very straight forward jobs out there where we know exactly the what, when and how. That’s fine; there are plenty of jobs that need doing, which are highly valuable (or ought to be), but that don’t take much higher order thought. But there’s plenty of complex problems to solve too, which can be addressed by a higher level process of thought. I hope when we view higher education in this way, it can become more graspable. Rather than a scary and mysterious realm of perpetually hard work, a place for the mind to be excercised.